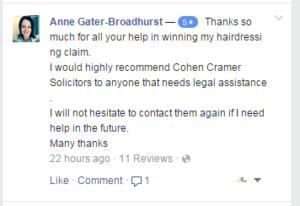 If you have sustained an injury as a result of treatment at a beauty salon or spa, tanning or nail shop, then Cohen Cramer can help; we are experts when it comes to dealing with beauty salon treatment claims and can help you claim the compensation you deserve. Eyelash damage – burns, infection and loss of the lash stemming from the substandard application of false eyelashes. Whatever the cause of your injury we can help you on a no win-no fee basis so that if your claim is not successful, you don’t pay us a penny for the work we have done on your behalf. A trip to the salon is meant to make you feel good about yourself, however, the lack of regulation in what is an expanding market means that sometimes standards slip, and the level of training received by those offering such services can sometimes fall below safe and acceptable standards leading to injury and loss. We will look to claim not only compensation for your injuries but also any financial losses that you may have incurred. 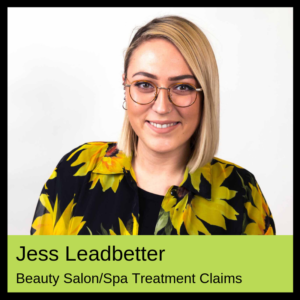 To see how we can help you with your beauty salon treatment claim as a result of negligent or poor treatment, get in touch with us today. enter your details in the contact box at the bottom of this page and we will get straight back to you. Remember, your claim can be dealt with on a no win-no fee basis, so to see how we can help you get in touch with us today.